Mushing is great exerise for energetic dogs and to be able to start you need a quality equipment and train your dog. You can find a lot of useful information on our website. From our store you can get an equipment for all dry land mushing disciplines, walking and running with your dog. Active Dog is no. 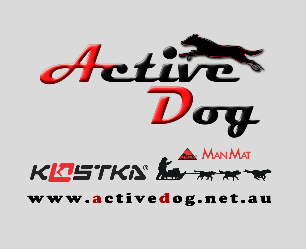 1 supplier of sled dog equipment in Australia. We are proud to be the Exclusive distributor of ManMat dog equipment and KOSTKA scooters. Many Yukon and Iditarod mushers using ManMat gear. All products and materials are manufactured in the Czech Republic. We operate mainly online but if you want to see our products or have your dog fitted for a harness please contact us before hand to arrange a visit. We are based in Baulkham Hills, Sydney. For more information and our products please visit our website.